According to Hindu puranas, there was a demon named Hiranyaksha, an incarnation of Jaya, who was a gatekeeper of Vaikunta (the abode of Lord Vishnu). He was born as an Asura due to a curse of the twin Rishis known as the Sanat - Kumaras. Hiranyaksha, who became vigorous by the boons obtained from Brahma, had hidden the entire world at the bottom of the ocean to prevent the Devas from becoming powerful. He was told that he was not the most powerful being in the universe, and that Vishnu was stronger. Hence, he searched for Mahavishnu, but could not find him. The demon dropped the whole world into the ocean and the earth sank to the bottom. 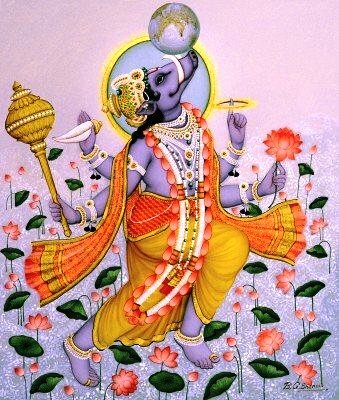 Lord Vishnu listened to the pleas of the Devas and took the form a giant boar or Varaha. He dived into the ocean, to bring the earth up which was waning at the bottom of the ocean. Varaha used its tusks to dig it out of the bottom, and carried towards the surface. The enraged Hiranyaksha interrupted the Varaha, and then commenced a battle which is believed to have lasted for a thousand years. Eventually, Lord Vishnu rescued the earth and restored it to its place in the universe. In this avatar, Vishnu married Prithvi (Bhudevi). It is said that Vishnu balanced the earth on his thigh and due to this a son was born to her. Since his son was created when Vishnu had been involved in a battle, he was an Asura who is the famous Narakasura.